He thrives on these experiences and especially on their familiarity. His well-being is served by his confidence that he will be able to go outside whatever the weather or time of year, and that he will be able to return and revisit these places soon: “come back later” and “come back soon” are refrains that he and his Mum share and that he knows will be true. Having walked at his own pace, without being hurried, along the street outside his house many times throughout his life, Tristan is alert to every feature and event, from the miniscule to the grand. What could easily be passed by in a hurry (in a buggy or car) as having no value to him, on the way to something more significant, is in fact very important to this ardent meaning-maker. The immediate locality and community provide the most relevant and interesting spaces for two year-old explorers and these are the very places they most want to take their time in, to experience as fully as they can. Each time Tristan revisits something along this journey, he adds to his understanding, builds new thoughts and has novel ideas. Because his abilities and thinking processes are constantly developing, he actually experiences the place in a new way. As he changes physically and mentally, new things become available in the same environment, so that the security of familiarity actually provides an ever-changing landscape of sensation and opportunity. The simple walk along this street has very high ‘affordance’ [Heft 1988] for Tristan; two year-olds do not need to go somewhere new all the time! Tristan is fortunate to have both an active local high street and a local park with wonderfully natural areas on his doorstep and accessible on foot. 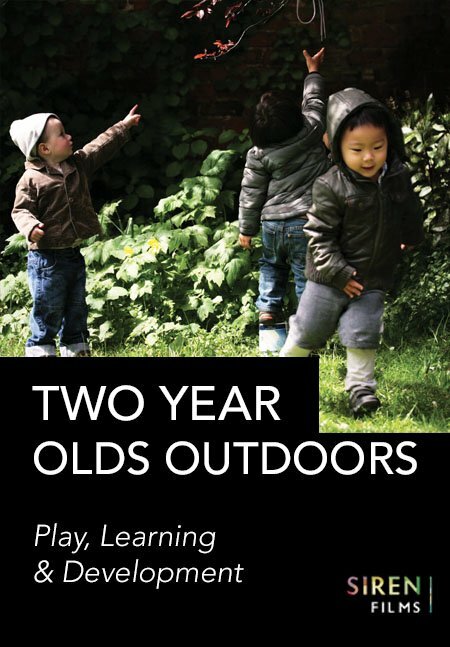 The two outdoor environments both provide extremely rich and stimulating places for the unhurried two year-old. However, he lives in an ordinary part of a large city. It is possible to find rich places in most locations – for children of this age such places do not need to be large or exotic, but they do need to be experienced on foot rather than in a buggy. Small daily forays into the local area can become a routine part of practice, providing another layer of outdoor provision (and a superb way of augmenting limited onsite outdoor spaces), when adults seek suitable and nearby spaces, become familiar with them so as to feel comfortable using them, and make regular, frequent visits and journeys in them with the same small groups of children.